Introduction / Part I The Levant: Dilemmas of Modernity: The Levant as a middle ground, Darwin / Why the Levant?, Holland / The claim to enter modernity: the Greek national programme in perspective, Hatzivassiliou / Greece’s westernizers: K. Tsatsos, P. Kanellopoulos and G. Theotokas on Greece’s cultural and political orientation, Kourkouvelas / Maidens and matrons, ladies and labourers: tradition and innovation in Greek women’s lives in the longue durée, Angelomatis-Tsougarakis / Part II The Anglo-Hellenic Connection: Bailed in: strategy, finance and the acquisition of Cyprus, 1878, Markides / Disraeli, ‘the key of western Asia’ and the echoes of history in the Levant, Kyriakides / Cyprus’ trade with the Levant, 1881-1946/7, Kazamias – Panayiotou / ‘The smell of Smyrna … is neither a Greek nor a Moslem smell.’ Toynbee, Greece and the Levant, Clogg / The British in the Levant during the 1940s: the experience of Cyprus and the Dodecanese, Yiangou / ‘Don’t let us spoil the ship for a ha’p’oth of heretics’. Identity issues in the British colony of Cyprus. The final settlement, Hamatsou / Merchants - consuls and intermediary service in the 19th century eastern Mediterranean, Chatziioannou / Part III Ambiguous Relationships in the Greek Levant: The Levant as a vanishing mirage: a tale of three cities, Mavrogordatos / Greater Greece in the early 20th century: Crete, Cyprus, Constantinople, Llewellyn-Smith / Greek policy in the Levant and the Greek community of Alexandria, 1947-1961, Koumas / Select bibliography / Index. 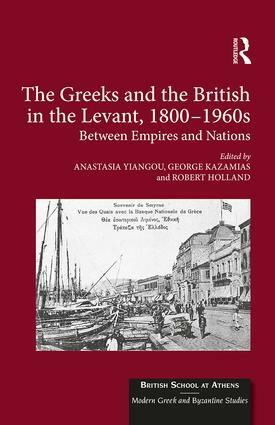 Anastasia Yiangou specializes on the history of British rule in Cyprus with a focus on the period of the Second World War and after. She is the author of Cyprus in World War II: Politics and Conflict in the Eastern Mediterranean (2010). She has taught at the University of Cyprus and the Open University Cyprus. George Kazamias is Associate Professor in the Department of History and Archaeology, University of Cyprus and former Dean of the Faculty of Letters (2011-2014). His research focuses on the relations of Greece with Britain in the 20th century, post-1960 Cyprus, oral history and the history of the Hellenic Diaspora. Robert Holland is an historian of the British Empire, with a special interest in the Mediterranean. He has published widely on Cyprus and on Anglo-Hellenic relations generally, including Britain and the Cyprus Revolt, 1954-59 (1998). He is a Visiting Professor at the Centre for Hellenic Studies, King’s College London.